South Africans continue to say “I love you” by investing in experiences over material goods, as new data shows sentimental spending has increased by 50 percent since 2015, with the number of transactions up by 63 percent during the same period. The annual “Mastercard Love Index”, created by analysing credit, debit and prepaid transactions across the past three Valentine periods (11th-14th February 2015- 2017), found that dining out for ‘date night’ remains one of the most popular activities for South Africans. Share of spend on restaurants has remained stable over the past three years, taking a 34 percent share of spend and a significant 82 percent share of transactions in 2017. Whisking your partner away for an unforgettable travel experience is also still a popular Valentine’s Day choice. Hotels take the highest share of spend (37 percent) with a nine percent share of transactions in 2017. The number of transportation transactions increased by 144 percent in 2017, accounting for 21 percent of total spend during the Valentine’s Day period. “The data supports the rise of the ‘experience economy’ as happiness clearly comes from creating lasting memories - worthy of posting on social media - instead of purchasing ‘things’,” says Mark Elliott, Division President, Mastercard Southern Africa. Money spent on traditional gifts such as flowers decreased by 25 percent in 2017 versus 2015 and the number of transactions decreased by 21 percent. Spending on jewellery decreased by 15 percent compared to 2015 but the number transactions remained flat. The data suggests that we are getting ahead of the curve when buying gifts. It’s no longer left until the last minute, as the majority (32 percent) of Valentine’s purchases in South Africa are made on the 11th February. However, just over a quarter (26 percent) of all transactions (between 11th – 14th February) were made on Valentine’s Day itself. The rise of online shopping in South Africa continues with an enormous 990 percent increase in the number of e-commerce transactions from Valentine’s Day 2015 to Valentine’s Day 2017. Nonetheless, 97 percent of transactions around Valentine's Day are still made in person with only three percent of gifts purchased online. “Spoiling your loved one on Valentine’s Day shows no signs of slowing down. Our data suggests that while people still purchase traditional gifts, the move towards putting on a great experience trumps all. 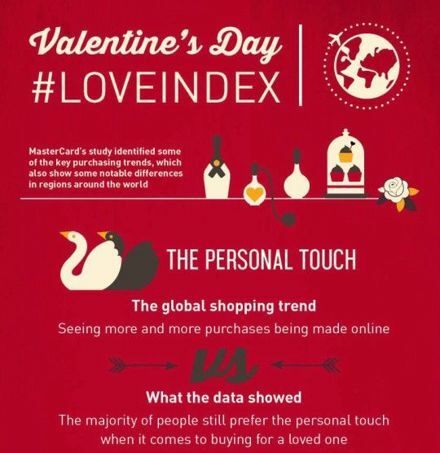 The Mastercard Love Index – now in its 3rd year – highlights global and regional trends to offer retailers priceless insight into consumer buying habits over the romantic period,” says Elliott.